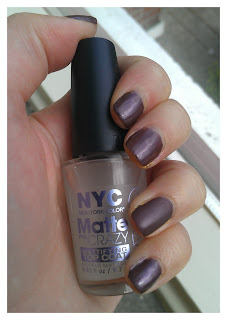 More then a week ago I scored this gorgeous topcoat, Matte me crazy by NYC. And I couldn't wait to show you how it looks on different nail polishes. Unfortunately I was stupid enough to not take pictures of every try out that I did because some effects were so cool! 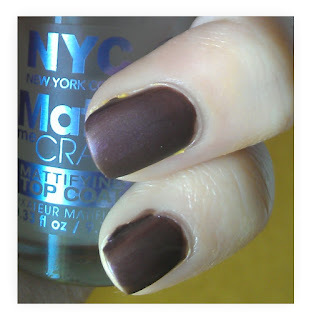 Basically you apply this topcoat to any nail your wearing and it makes it matte. Which can creat really cool effects. I bought this topcoat for only €2.30. Click on the picture of a bigger & better picture. 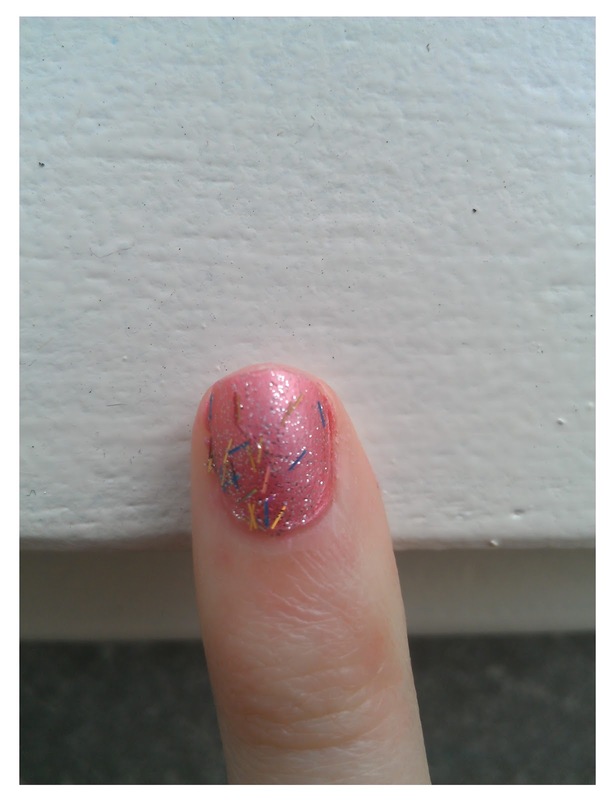 To show the differents between without the topcoat and with the topcoat I decided to only do my ring finger on this picture. A close up of these nails. The nail polish that I'm wearing is Essence's Princess Prunella. 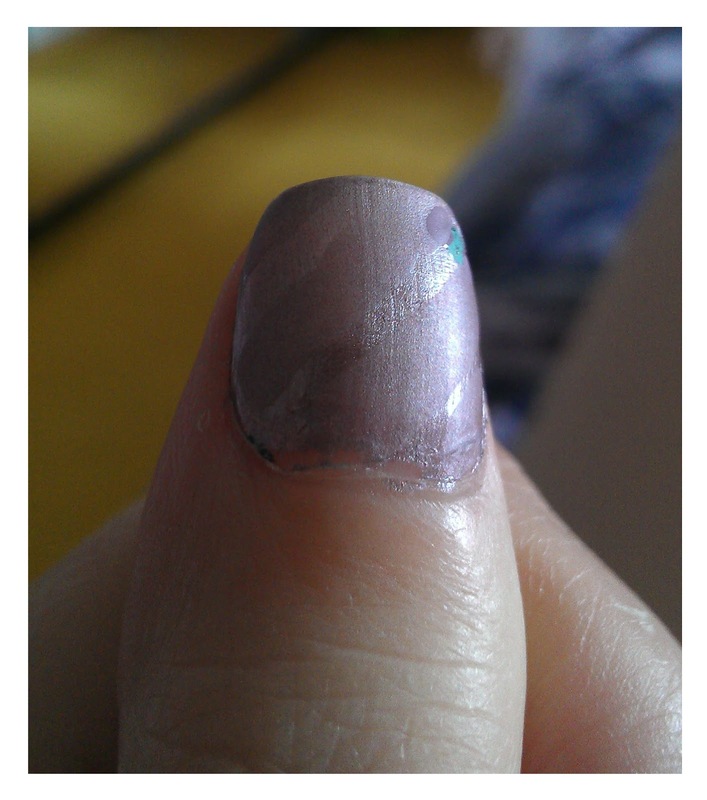 Another one, I'm not wearing the topcoat yet, so this is the before. And this is after. In real life the differents is a lot bigger than it shows on the pictures. But I still found it worthy to show. I'm wearing Royal flush blush [OPI] with on top Save me [OPI]. The topcoat has more effect on the nail polish under need than on the glitters. The topcoat on Pedal to the metal [Sally hansen]. I striped these and as you can see it gives a really nice effect. 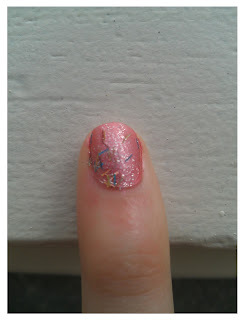 I was also wearing this topcoat partly on my nails on the pictures of the blog post My nail with a moustache, on the moustache part to make the black more black. Last but not least of the picture series this picture. I'm wearing the topcoat on my middle finger on top of the shatter and on my ring finger. The shatter didn't really worked out as planned because you can't see any differents. I specially choose the silver shatter because all my other shatters are way to matt already. But you can see the differents on my ring finger, which is really cool because this yellow nail polish is pretty matt by it self. 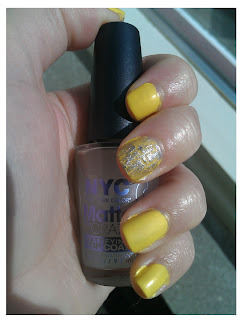 The yellow nail polish is from Essence in the color Wanne be your sunshine. These are my swatches of today. You will probably see Matte me crazy in a lot of other nail art pictures of me because I really like the effect of this nail polish. & I would love to see your combinations with it !